Ion Mobility Spectrometry, Volume 83 will focuses on new trends, methods and instrumentation in the field, starting from the innovations of each technique, to the most progressive challenges of IM-MS. 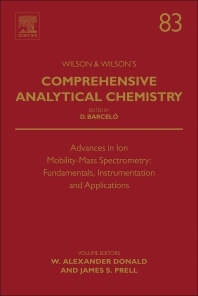 Chapters includes section on Recent advances in IM-MS, IM-MS Principles and Theory, IM-MS Applications and Instrumentation, and the Future of IM-MS.
W. Alexander Donald joined the School of Chemistry at UNSW Sydney in 2013 after two years as the Centenary Research Fellow at U Melbourne (2011-2012). Alex completed his graduate research in the group of Professor Evan R. Williams at the University of California, Berkeley (Ph.D. 2010). He has received an Australian Research Council Discovery Early Career Researcher Award, an IUPAC Prize for Young Chemists, the inaugural Michael Guilhaus Research Award (Australian and New Zealand Society for Mass Spectrometry), the Royal Australian Chemical Institute’s Physical Chemistry Division Lectureship and Analytical & Environmental Chemistry Divisions Peter W. Alexander Award. Alex was selected as an emerging investigator by The Journal of the American Society for Mass Spectrometry (2017), The Analyst (2016), and Analytical Methods (2015). The Donald research team develops and applies mass spectrometry methodologies and instrumentation to problems in bioanalytical and biophysical chemistry.